These sturdy Loose Leaf Rings are useful for a variety of applications, such as presenting samples, binding laminated sheets to hang in a common area, keeping recipe cards together, and many other uses. They open easily to accommodate your items, and snap closed, securely locking into place. Loose leaf rings are perfect for swatch books, samples, or quickly binding loose sheets of paper, so they are great to keep on hand. These rings come in a box of 100 each. Welcome to MyBinding video. 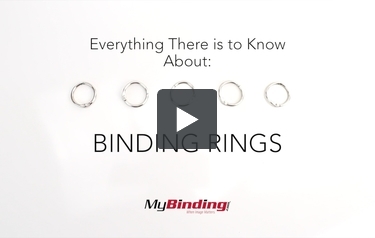 This is everything you need to know about Binding Rings. They come in sizes ranging from ?" all the way to 10". The smallest size can probably hold close to 100 sheets of 20lb paper and here's the largest size next to 4 reams of paper. That's 2000 sheets. Binding rings actually work better with less conventional uses, like keeping score at a game or holding your flash cards together, even making your own note pads. There are 2 types of ring bindings. This is less secure, which just unsnaps and snaps back on and the more secure screws together to ensure that your pages don't fall out and there are different benefits for using either type. Within the conventional 3-hole punch, when using the more secure rings, your pages will have a bit more trouble getting past the screw part. With the less secure, your pages move freely throughout the entire ring. And those are binding rings. For more demos, reviews and how-to's, go to MyBinding.com.